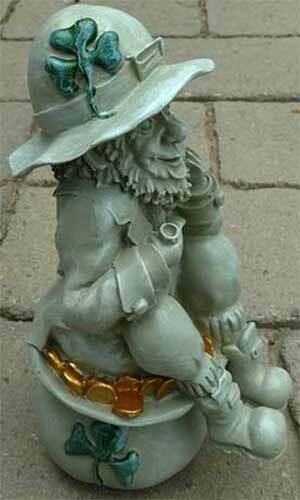 Leprechaun statue would look grand sitting in your garden while he is on his pot o' gold. This leprechaun garden statue is great for outdoors! This leprechaun is suited for the outdoors and would look great on your lawn as a garden statue. The distressed tan leprechaun garden statue is made of resin that is accented with green shamrocks and gold coins. 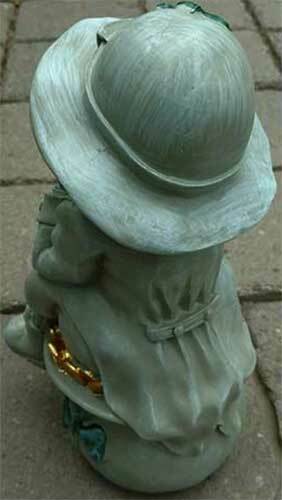 The leprechaun statue is sitting on his pot 'o gold and is 13 1/2" tall.